Our Straker Chalet is amazing. The Straker Chalet is a luxurious, contemporary Swedish style with three fully fitted bedrooms, including an en-suite master bedroom with super king size bed, one king-size double room and one twin room. 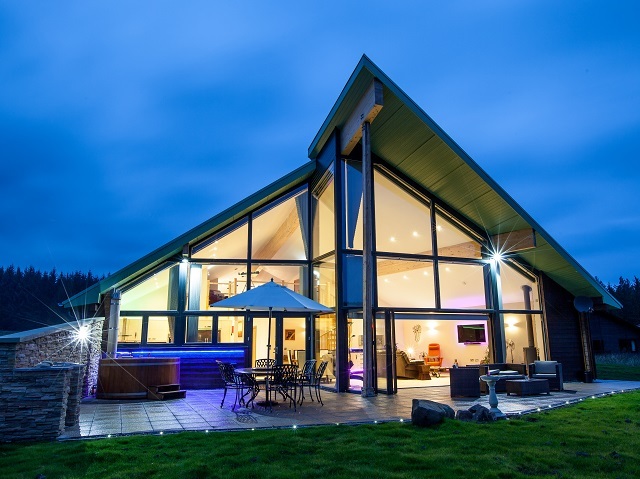 Enjoy panoramic views across the stunning Kielder Water & Forest Park or star gaze England’s darkest skies while you relax in the eco-friendly hot tub on your private terrace. The chalet has a fully equipped kitchen with everything you need to prepare, from a cheese sandwich to a gourmet dinner for 6. But if you want someone else to do the cooking, our kitchen is open for hearty breakfasts, lunches, evening meals and takeaway options. DURATION 3 Nights (Friday to Monday night inclusive). CAN DOGS COME? No, Not here, but ask us about our Pet-Friendly Chalets. pm or email enquiries@calvert-kielder.com leaving your name and telephone number and we will call you back as soon as we can.